The Lowrance Elite 7 Ti is a chart-plotter that creates an equilibrium among high performance, top-notch functionalities and great user-friendliness. Beyond that, it changes the game of fish finding by brandishing sonar scanning features such as DownScan Imaging, StructureScan and CHIRP. 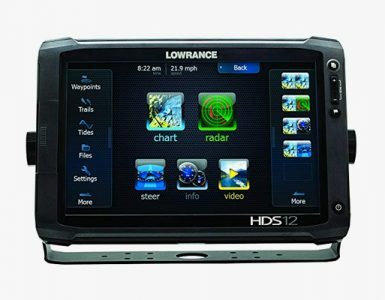 With features such as Bluetooth and GPS navigation, the Lowrance Elite 7 ravishes the minds of almost every fisherman and provides great reliability for everyday-fishing. 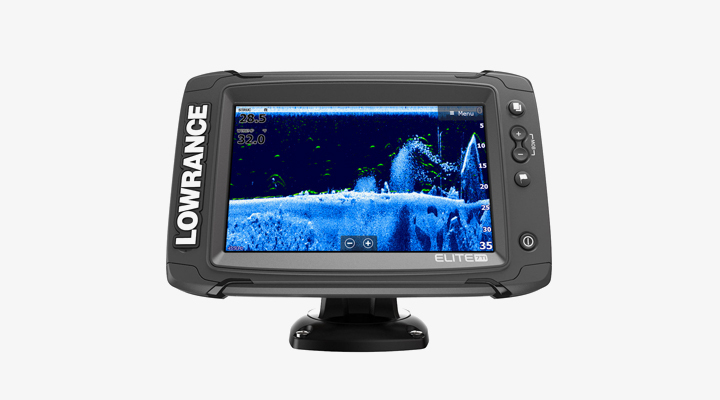 An upgrade from the Lowrance Elite 5 sees the Elite 7 Ti with a larger screen and more advanced features. The goal was to allow anglers to get CHIRP sonar at a more affordable price and that’s certainly what Lowrance has done with the Elite 7. It brandishes a 7-inch touchscreen display and enables viewing of game targets at a high resolution. It also has a 800 x 420 resolution which paves the way for better view. The CHIRP technology employs a range of frequencies concurrently, and stands online to determine fish reaction while eliminating clutter at the water’s surface. Therefore, it doesn’t matter if you’re in salt or fresh water, the Lowrance Elite 7 ti Totalscan Fish Finder will help you to separate fish target and identify them individually. It also boasts DownScan Imaging and StructureScan that enables you to see almost everything that is under your watercraft. These sonar features also fish finding to become much easier. You can find your targets more easily and simultaneously enjoy the amazing view of the underwater world. With regards to maps, you can use sonar history to create your own customized maps by utilizing an Insight Genesis service. This is an online service that allows you to upload your data to the account, modify contour lines, add extra bottom details and store on your microSD card. If you’re unaware of your location, its integrated GPS antenna collaborates with its highly dependable navigation mechanisms to swiftly compute your exact location. This combination allows lets you operate the device with great ease. If you think your device’s software needs to be updated, you can download new software features via its built-in Wi-Fi functionality. This will result in faster navigation through the software features and improve the overall performance of the device. Where would all these additional data be stored? Well, this device has a microSD card slot that allow you to store all your map information, waypoints etc. all in one place. Therefore, you want nothing to worry about when it comes on to space. Well, it all comes down to the size of the microSD card. Beyond that, its Bluetooth technology which allows you to connect the device to different Bluetooth-compatible device up to 100 feet away. Hence, you can share map information and waypoints with other fishermen. There are 2 other models of the Lowrance Elite 7 Ti. The Ti DownScan model features a single touch screen 7-inch LED display with exceptional backlighting capability. 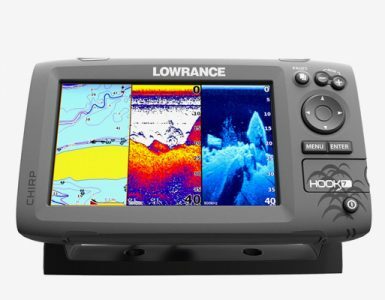 Its high-resolution display makes it easier to see your target fish and areas underneath your boat. Furthermore, its touchscreen function allows quick navigation of all the different features of the device. All you need are just a few swipes and fingertip touches! On the other hand, the Elite 7 Ti without Transducer is also a model of the Lowrance Elite 7 product line. Like the other two featured chart-plotters, it packs top-line features and extreme performance in a single chart-plotting unit. Its amazing 7-inch display offers a large view which allows for better visibility of screen items. Above that, it has customizable split-screen operations. Unfortunately, it doesn’t have a transducer. What this means is that this device cannot send or receive echo to be displayed on the screen. Lowrance has repeated their amazing work in producing these spectacular chart-plotters. 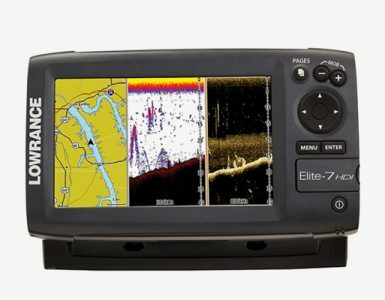 The Ti TotalScan, Ti Elite 7 Fish Finder without transducer and the Ti DownScan all bring forth great performance, along with superior features to aid the typical angler in finding fishing. Even though all 3 units have almost identical features, there exist a few differences among them. In my view, the Lowrance Elite 7 Ti Totalscan really stands out because of its affordability when compared to the others. Unlike the Lowrance Elite 7 Ti Downscan, it has a transducer which act as an assistant in StructureScan sonar technology. Besides, it still manages to offer excellent performance and provides superior features to its users. Be vigilant. Be unique. Be smart and get yours today!